Researchers at MIT, Oak Ridge National Laboratory, and King Fahd University of Petroleum and Minerals (KFUPM) have devised a process to repair leaks, cracks and holes that are formed in graphene in the process of creating membranes for water filtration and desalination. The process relies on a combination of chemical deposition and polymerization techniques. The team also used a process it developed previously to create tiny, uniform pores in the material, small enough to allow only water to pass through. These two techniques combined yielded a relatively large defect-free graphene membrane, about the size of a penny. The first step of this process includes the use of atomic layer deposition - placing the graphene membrane in a vacuum chamber, then pulsing in a hafnium-containing chemical (that does not normally interact with graphene, but if the chemical comes in contact with a small opening in graphene, it will stick to that opening). 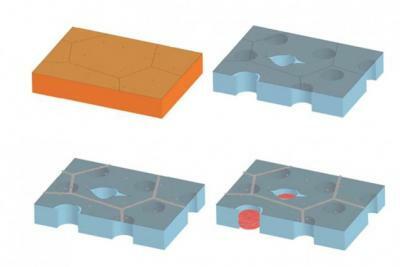 The team found that the deposited hafnium oxide successfully filled in graphene’s intrinsic defects. The second step involves using a process called “interfacial polymerization”, often used in membrane synthesis. After filling the graphene’s intrinsic defects, the researchers submerged the membrane at the interface of two solutions: a water bath and an organic solvent that, like oil, does not mix with water. dissolved in the solutions were two different molecules that can react to form nylon, creating nylon plugs in the holes and tearsealing the defects. The scientists tested this process by pumping water through a graphene membrane treated with both defect-sealing and pore-producing processes. They found that water flowed through at rates similar to current desalination membranes, while being 600 times thinner than existing membranes. The graphene was able to filter out most large-molecule contaminants, such as magnesium sulfate and dextran. The preliminary tests suggest that graphene may be a viable alternative to existing filtration membranes, although the techniques to seal its defects and control its permeability will require further improvements.